Students in this concentration work to develop competencies in broad-ranging aspects of rabbinic literature. Study focuses on the historical development of rabbinic Judaism in its late-antique context as well as the various styles of rabbinic expression and rhetoric. 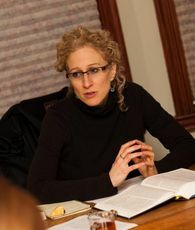 Students are trained in a variety of disciplinary approaches including literary and cultural criticism, as well as historical and sociological analysis. Students draw on related fields such as biblical studies and medieval and modern Jewish literature and culture. The advanced study of rabbinic texts requires near-fluency in Hebrew and Aramaic and familiarity with related fields, including biblical studies and the history of late antiquity.